Since my last report I have spent some time visiting LBJ - His ranch in Stonewall, TX, his boyhood home in Johnson City, and his presidential library in Austin. I drove to Austin on a day that started with snow and sleet - and it was Friday the 13th! But the weather cleared and I made it to Austin with no problems. On my first night in Austin they had what one TV station called the worst snow storm in Austin in 50 years. I had to clean at least 1/2 inch of snow off my windshield, and drive on wet roads into town where I found the Texas History Museum had delayed opening for 1 hour due to bad weather. I waited outside under clear skies and bright sun until they opened. 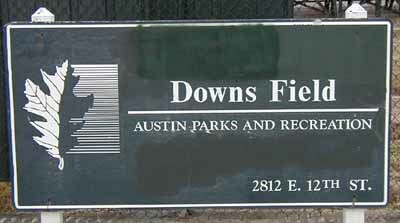 Downs Field in Austin, Texas. From Austin, I moved on to Livingston, TX. I decided to skip the side trip to Downs, TX. On the way to Livingston, on the northern outskirts of Houstin, I was reading road signs checking for my next turn when I rounded a corner and suddenly discovered the guy in front of me was stopping for a changing light, and I had neither time nor space to stop my 16,000 pound truck and trailer. With smoke pouring from my screeching tires, I was able to move to the right, and pass in the breakdown lane without hitting anything, ending up in the middle of the intersection. I coasted to the other side and needed a couple of minutes to regain my composure before continuing on my way. I am very much aware that I need more space to stop than a car, and I usually drive in the right lane at 55 or less, with plenty of space between me and the vehicle in front of me. In this case I was in a 45 zone, and was doing 45 or less, but I allowed myself to become distracted. It was a narrow escape. Rainbows End, in Livingston, is the home of the Escapees (SKPs) RV Club ( my snail mail address is 120 Rainbow Drive #2045, Livingston, TX 77399-1020). I took a tour of the campgrounds, the national headquarters, the mail service, and Care, the adult day care center. The mail service is the largest privately run mail service in the country with more than 11,000 subscribers. The Care Center helps sick or injured Escapees to continue living in their RVs by providing meals, help with laundry and shopping, and for the more disabled, adult day care to allow the spouse or companion some time off. The campground is a mixture of conventional RV spaces, and larger owned lots. Some owners have built very interesting buildings that are designed around an RV. I spent 4 days at Rainbows End, then moved my rig to an SKP storage area and took the bus back to Mt. View, CA for a Dr. appointment and a visit. I expect to return to Livingston in a few days and will have some repairs done to the trailer (I lost a wheel lug, and I will finally get new tires) before moving on toward Florida. 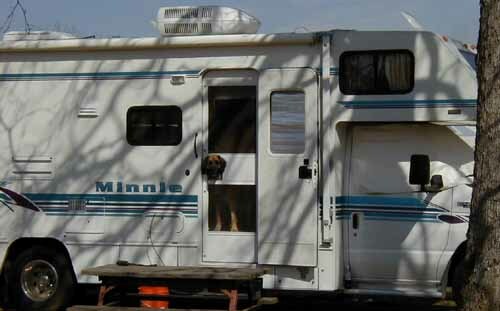 This dog has found a good way to keep track of what is going on near his RV home.